What’s Behind the Coming Water Crisis? Water crisis are the biggest global risk we face between now and 2025 according to World Economic Forum. Water scarcity isn’t just about water to drink and grow food but water to produce energy, to provide materials for housing, water for clothes, paper, cars, electronics and everything else. When I talk about how we need water to make anything in schools, I ask the kids to use their water vision to find something that doesn’t need water to make. No one has succeeded yet. When it comes to water scarcity the ‘rhino in the room’ is the ocean-sized consumption of hidden or virtual water consumed to grow food and make stuff. On average North Americans have a water footprint of 8000 litres of water per person per day. Carrying that amount water would be like hauling 5 or 6 cars every day. Of this 8000 litres (2,000 gallons), only 300 to 400 l of this is comes out of our taps for drinking, washing, cooking or flushing. The rest — the 7500 l is hidden in for the food we eat, the clothes we wear and the things we buy. This hidden water is also called virtual water. It is the water consumed to grow things or make stuff. By consumed I mean that 7500 we consume each day is water that can’t be used for anything else. This is water that evaporated, remains polluted or cannot be reused in a reasonable time frame. — Excerpt from 2016 presentation based on the award-winning book Your Water Footprint by Stephen Leahy. 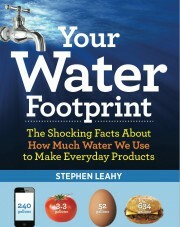 Stephen will be doing more talks in 2016 about about his prize-winning book Your Water Footprint: The Shocking Facts Behind Our Thirst for Earth’s Most Precious Resource (Best Science Book in Canada). Stephen is also an expert on the United Nations climate talks and climate science. He is a winner of the prestigious Prince Albert/United Nations Global Prize for his Climate Change and Environment Reporting. As a journalist he has written over 2000 articles on science and environmental topics around the world for National Geographic, the Guardian, New Scientist, IPS, and many more. To inquire about Stephen speaking at your event please complete the contact form below. Please fill out the form below – it helps reduce spam. Yes, this really works and I will reply — Stephen.